Crappie - Fishing with Gus! Crappie, also known as speckled perch in the piedmont area of North Carolina, are fun to catch and great to eat. They can be caught year round, but the best daytime fishing is in the spring and fall when large schools move to shallow water. Most are caught on small jigs and live crappie minnows. Don’t worry if you missed the spring spawn this year. They still can be found in deeper water throughout the summer. Warm weather crappie locate around bridges, boat houses and in deeply submerged brush piles. They are most active at dark when the water is cooler. Night fishermen use lanterns and fluorescent lights to attract bait fish, which in turn attract crappie and other predators. Green glow lights suspended above or below the water, work well. Lights are available in lengths from 12″ to 48″. They not only attract fish, but also illuminate the fishing area which makes it easier to maneuver in the dark. Boat houses offer the shade, cover and cool water conditions that crappie prefer. Many anglers pitch jigs around boat house door openings. If you can fish from within a boat house, that’s even better. Under the cover of darkness, serious crappie fishermen secretly sink Christmas trees and other woody debris to make brush piles. They only fish these secret holes when the area is void of other crappie fishermen. While Christmas trees are popular, but they deteriorate quicker than hardwood brush and must be replenished each year. Small reels mounted on long fiberglass fishing rods have replaced the once popular cane pole. Regardless, either will catch crappie on light line with an adjustable float and a tiny jig or minnow. A light weight closed faced spinning outfit is also effective when fishing under boat docks and near partially submerged brush. The key to catching crappie is to fish gently. Move the bait ever so slowly, give the fish plenty of time to nibble the bait, and carefully play the fish to the boat. The larger the crappie, the more likely the weight of its body will pull the small hook. The state creel limit for crappie is 20 per angler per day with an 8″ minimum size limit on Lake Norman and the Yadkin River chain of lakes. There is no minimum size limit on Lake James, Rhodhiss or Hickory. Crappie can grow to 8″ in length within twelve months. Growth then slows to about 1″ per year. 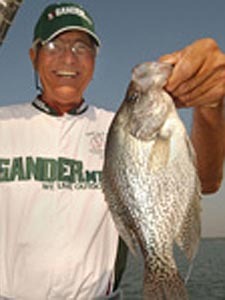 Large crappie (those over 12″) are known as “slabs.” Slabs are prized by fishermen for their great fighting ability on light tackle. Crappie fishing is a family sport and a culinary delight. Give it a try! When using jigs to lure crappie, experiment with different colors and types of tails. At times, fish prefer twister tails, tubes, or jigs dressed with Malibu hair. When all else fails, use a plain jig-head, tipped with a live minnow.